What do a skate park, a Japanese bathhouse and a brewery have in common? They are all student projects being designed and constructed to create a scale model. Architectural engineering Interdisciplinary Capstone Project (ARCE 415) is an interdisciplinary course that combines the creativity and abstractness of architectural design with the mathematical mindset of architectural engineering. 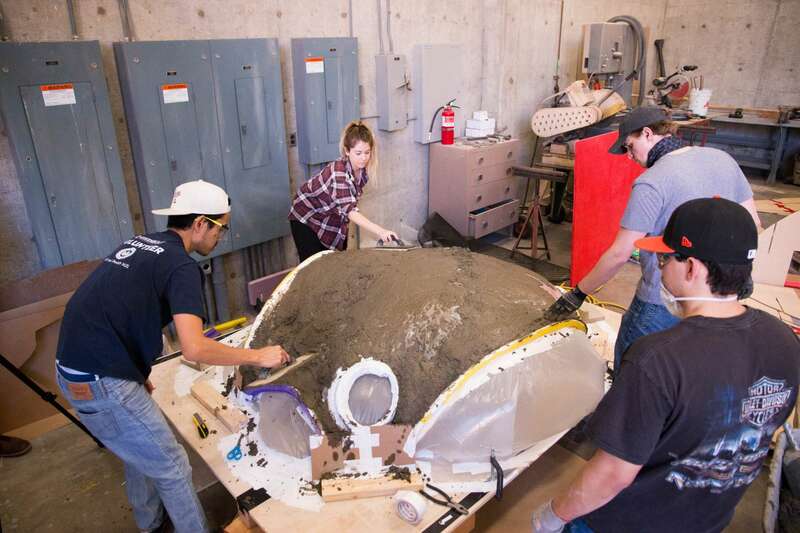 Thirty-eight seniors in teams of seven design, plan and construct 3-inch-thick, cement structures in 10 weeks, taking what they learned in the classroom to the field. Architecture senior Lillian Cao and her team constructed a Japanese spa house, one of four structures students must choose to build. “It’s a fun little place because none of us understand the culture of Japan, none of us have been to Japan, but we were intrigued by that [study abroad] program. We have never been challenged that much so we thought it’d be cool to put this in a place where we’d be able to explore,” Cao said. Designed to be a challenge, the class is co-taught by architectural engineering professor Ed Saliklis and associate professor of architectural design Clare Olsen, who want students to gain hands-on experience working together. Saliklis has traveled around the world teaching and studying different architecture sites. Olsen has traveled abroad to Tokyo teaching architectural design. With both professors so well-traveled, it is no wonder the concept and projects of this class are strongly focused on foreign structures. The concept of ARCE 415 was based on Saliklis’ strong belief in traice de la main or “the touch of the hand,” an idea that students should not only plan and design these structures, but build the structures and make them work. “This idea of someone making something with their hands, even if it’s just sculpting the concrete … that tradition is being lost around the world,” Saliklis said. Saliklis was inspired by two architects, Félix Candela and James Turrell, to form the requirements of the students’ projects. Taking the different aspects of their styles, Saliklis was inspired by Candela’s thin, concrete shell designs and Turrell’s stylized light effects — LED lights that adapt to dusk and dawn. With this, students must integrate each of these concepts and more into their structures within 10 weeks. “People keep asking me, ‘Why do you keep teaching this?’ And I want the students to come up with something that I can’t believe they came up with,” Saliklis said. Some students walk in and become overwhelmed by the syllabus. Not everyone can handle the pressure of designing and creating lifelike models in 10 weeks. “Some people stand up, put their backpack on and walk right out the door because they’re overwhelmed,” Saliklis said. Despite the difficulty of the classwork, the chosen sites of each structure were hand-picked to stimulate creativity and interest in each team. Chosen and designed by Olsen, there are four structures each team must choose from: a Japanese spa house, a skatepark in Madrid, a pub and brewery in Portland or a museum and sculpture garden in Miami. Though not real structures, students must take into account the physical location and the different culture when designing and constructing their project for the site. “I wanted to pick international sites that students would feel excited about doing something different from what they have done before,” Olsen said. Personally intrigued by the culture and foreign architecture, architecture senior Gabriela Ojalvo and her team also constructed a Japanese Spa house. “[The Japanese spa house] called for a unique space that I have never designed before … I think that intrigued us. Personally, I started to develop this interest in Japanese culture and architecture and it was fun to kind of explore that,” Ojalvo said. With this class, creativity and engineering must go hand-in-hand for the project to be successful. Architecture and architectural engineering students must work as a team to make their lifelike models as creative and structurally sound as possible. “You get to see things from a different perspective, I got to expand my breadth of knowledge of this field and come about it with a different angle. It was helpful to communicate with [architectural engineering students] and get our ideas across more clear,” Ojalvo said. One team created a skatepark model with the use of a “big balloon” to inflate and support the structure as the cement dries. Another team used waffle grids — cardboard shaped into grids — filled with soil to support their model dries. “At the end of [a] journey in architecture, we kind of describe it like birth. You go through this very long period of time of blood, sweat and tears, and pain and agony. Then there’s this final push and when you’re looking at it, no matter how ugly it is, you’re still going to love it,” Cao said.